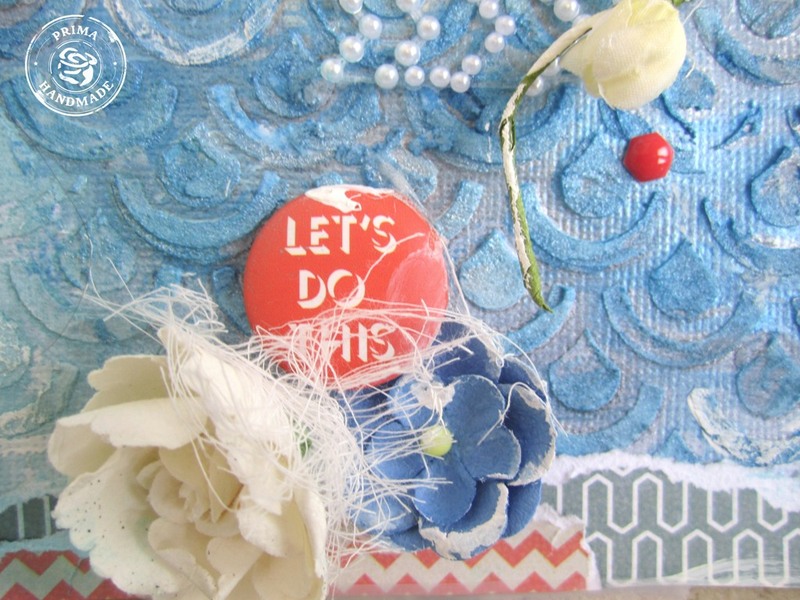 I’m up on the Prima blog today with a red, white and blue palette perfect for the 4th of July. Although I don’t celebrate it here in Canada, I though I could combine those colors to create a summer beach layout. I got inspired by the 12×12 Elemental stencil. 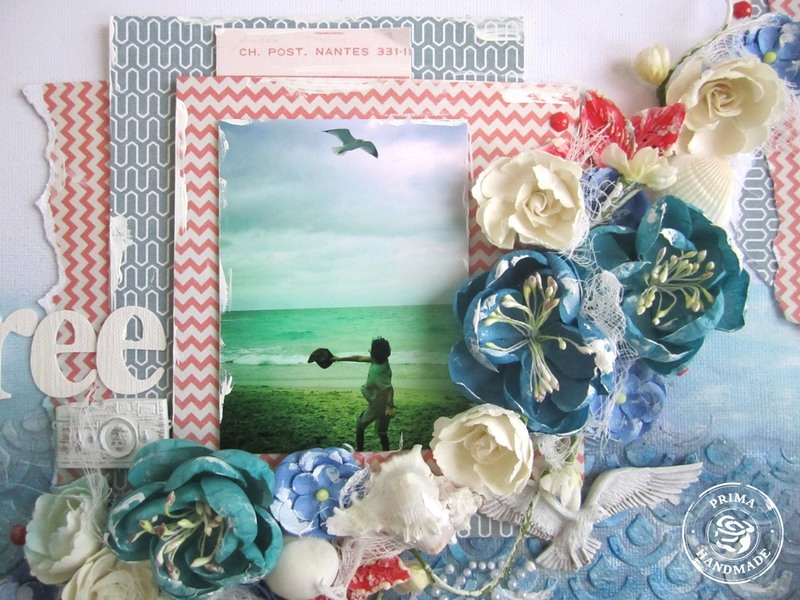 The shape reminded me of the ocean’s waves and I wanted to create a serene beach layout. I used pieces of papers in both reds and blues to match the July 4th red-white and blue palette. I used deep, rich Shimmerz sprays in both blues and turquoise to get the water in different shades, like the real ocean. I used Jenny B Blue, Sea Foam and Rock-a-fella blue. This was the perfect layout to combine with a challenge at Shimmerz which requires you to use a mask. Check out the challenge here on the Shimmerz blog. 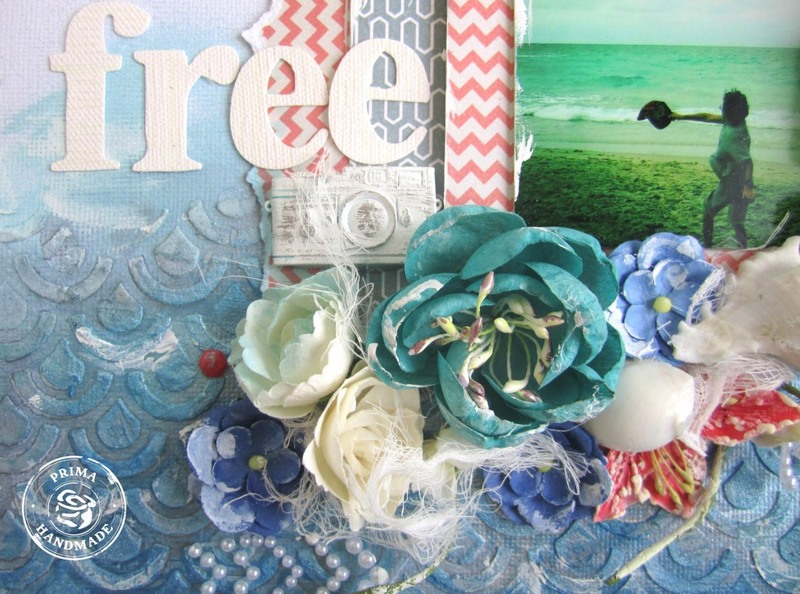 I used lots of matching Prima flowers for embellishments and the resist canvas alphabet which I didn’t even color. Pearlescence: blue and white, shells. Oooh pretty! Love the masking & spritzing!! 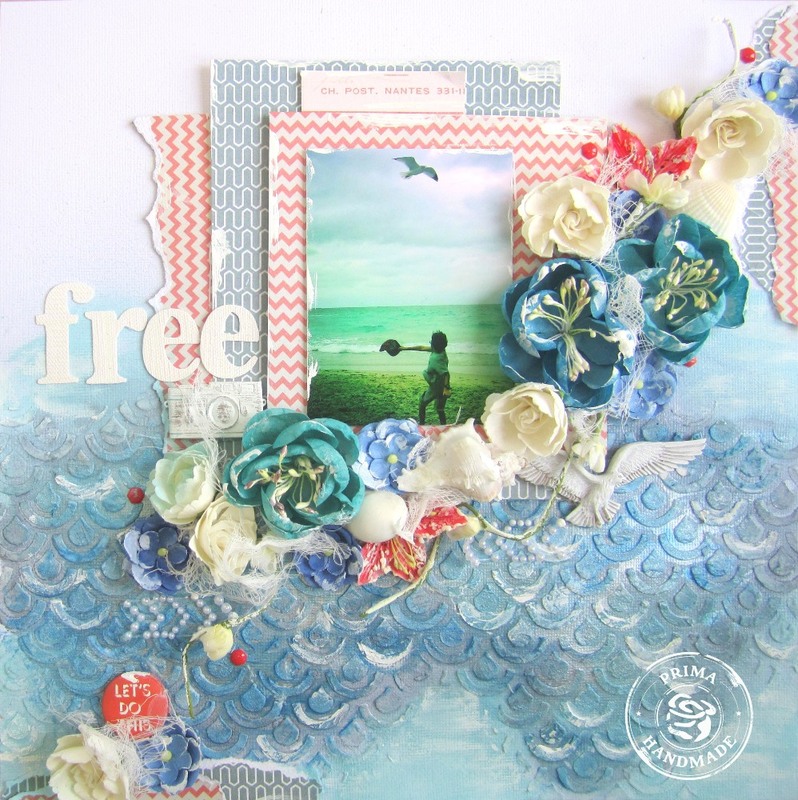 So cool.. the wave texture is wonderful, and I love that spray of flowers travelling across the whole layout! Keren, you did Red/White & Blue Proud!! I love the stencil work and your design. Such a beautiful project. I really like this one, Keren! So pretty- and Happy Birthday to you too!! Wowwwwwwwwwwwww! This is gorgeous! I love love love love the flowers, the textured background and the layers!! Oh my. The background texture is phenomenal! Oooooooooh! I am in love with your stencil work, Keren! AMAZING page! Oh wow Keren, this is truly amazing artwork. So love the beautiful colours and wonderful textures. Your talent never cease to amaze. Gorgeous, Keren, as always. I never saw your layout that I didn't like. How do you store your layouts? Each one of them deserves to be framed in a shadow box 🙂 I don't think I congratulated you before on joining the Prima DT. So happy for you! They are lucky to have you, you are very talented and inspiring designer. This is so beautiful.. 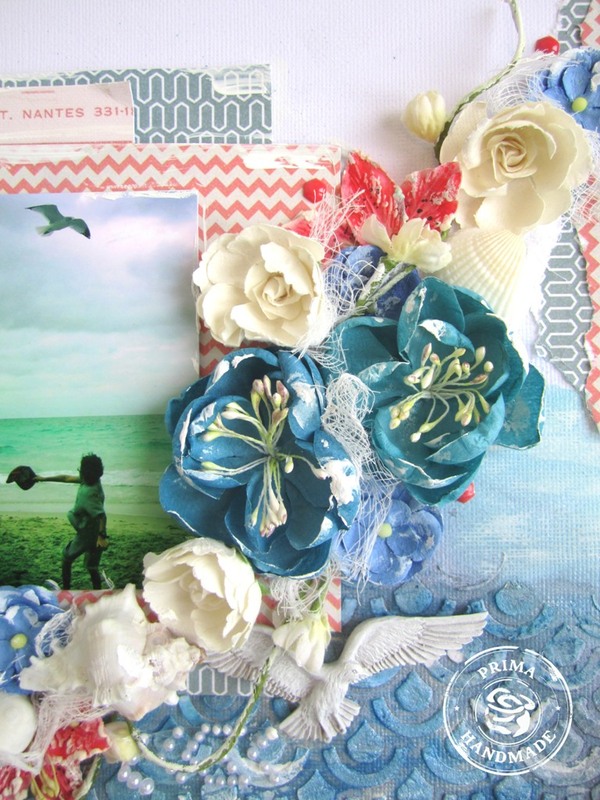 I love the scalloped texture under the photo!! Love this Keren! Your waves are stunning. Never used Shimmerz, I keep trying to not fall in love with more new product…. But you make it look so good! Super, super page and love the background! Great 4th of July page!